The Eindecker was the first purpose-built German fighter plane. However, it was most significant for being the very first fighter with a machine gun that could be fired through the arc of the rotating propeller, without hitting the blades. That feature was enabled by a special "interruptor gear" which prevented the MG from firing a round when the propeller blades were in a position to be struck. 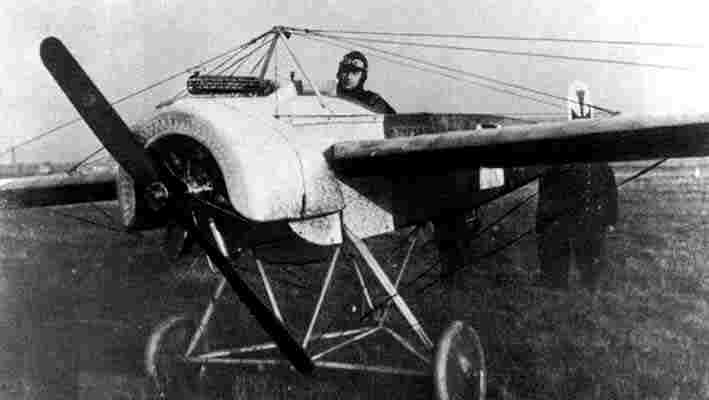 This invention gave the pilot of the Eindecker a decided advantage over his opponents, who - until they developed a similar mechanism some time later - were generally* restricted to firing MGs outside the arc of their prop; and thus began a period that came to be known as "The Fokker Scourge". In the European theatre the Spitfire managed for most of the war to maintain either parity or superiority against its principal opponents; the main exception being a period of almost a year during 1941/42, when the German Fw 190 was clearly superior to the Spitfire Mk. V (the current model at that time) in most important aspects. The performance gap was closed by the introduction of the Spitfire Mk. IX in June 1942, with continuous improvements and successive marks keeping the Spitfire at parity or better for the remainder of the war. A significant upgrade was the introduction of the considerably more powerful Rolls Royce Griffon engine which powered some of the later marks and helped the British fighter to continue to remain highly competitive. However, physical attributes and effective design aside, perhaps one of the most enduringly important things about the Spitfire was what it came to stand for; to the Allied side in general but particularly to the peoples of the British Commonwealth/Empire. To many, it became a symbol of freedom and their struggle against tyranny; its very existence - to say nothing of its presence - boosting morale. This powerful feeling about the Spitfire has carried down the generations to the present day. To be sure, some other fighters have been inspirational to their people; but perhaps none in quite the same way as this Supermarine design which "made its mark" during the darkest days of the War and in particular, during the Battle of Britain. Will you find yourself leaning towards the Eindecker, or to the Spitfire in this match? Last edited by panther3485; 01 May 15, 11:00. I went Fokker. Both airplanes are outstanding, but the Fokker had many firsts. I had to vote against a spitfire. Now I am sad. Influential vs significant. This is going to be tough. Has to be the Spitfire. Its fame transcends the technical deliberations of self-appointed pundits like ourselves. The value of Mitchell's creation was incalculable,proving that here,at least and at last,was one war machine to match the best the hitherto invincible Germans could field. Significance and influence in spades. Yes, but for the real purpose of this thread the Eindecker is the right choice. I still have to go with the Eindecker as the most influential aircraft of all. The Spitfire's significance was that it stayed the front line fighter throughout WWII and influenced nations too. It's engine also led to the capabilities of the Hurricane, Mosquito, Lancaster and Mustang. No other aircraft of both wars can boast that record. Except, the P-40, P-38, P-47, Yak 1, A6M, Ki 43, Ki 44, Me 109... to name a few. The engine isn't the airplane. The Allison engine was easily as widely used as the Merlin even if it's altitude performance was not as good. The Hurricane predates the Spitfire so it had no influence on that design. The significance of the Spitfire is that it was the right airplane to save Britain in 1940 from defeat in the air. After that, it was just another fighter in a bevy of similar fighters. It's participation in the Pacific War was almost nil. It played an insignificant role in Russia. If you want just participation, the P-40 has more in every theater of the war except the ETO just the reverse of the Spitfire. It's influence on aircraft design was minimal. No one copied the elliptical wing. The radiator design was an NACA one. It's not that it wasn't a good fighter, it was. But outside the BoB it was just another fighter in a very big war where there were lots of good fighter aircraft flying. The E III represents the first time a practical and successful aerial fighter aircraft appeared. Yes, there were other attempts before it like the Gun bus but they didn't represent a really practical solution. That is the significance of the E III: It was the first practical and successful fighter plane in history. The engine isn't the airplane. The Engine is the integral part of the aircraft. without it, it would not fly. The Merlin was part of the Spitfire story from prototype to relegation, the priority from the Merlin C to the 65, was for the improvement of the Spitfire. The Merlin was also the best of them. All those above are in the second division. they never powered the best all round combat aircraft to date, one of the best bombers and two best piston engined fighters of WWII. If the Engine isn't the aeroplane, what was it that gave the airframe its power? what was it that gave the aircraft most of its performance? what got it into the air? The power plant is integral, without it you have a useless piece of alloy. the same as without a heart you have a dead animal. "The critical Mach number of the Spitfire's original elliptical wing was higher than the subsequently used laminar-flow-section, straight-tapering-planform wing of the follow-on Supermarine Spiteful, Seafang and Attacker, illustrating that Reginald Mitchell's practical engineering approach to the problems of high-speed flight had paid off." Alfred Price. As for the rest of your argument on its combat history, you are rather lacking in knowledge. I'm sure I said as much in the last round. I'll finish by saying that I refer you to my last sentence in round 4. The Merlin was a good engine but hardly alone. Daimler's DB 600 series was its full equal and in many ways a better engine. It was fuel injected for example giving less variance in performance that the carbureted Merlin. It also wasn't prone to fuel starvation from negative G's the way early Merlin's were forcing Spitfire and Hurricane pilots to roll into dives. The US Allison V1710 was equally good to 15,000 feet. It was let down by USAAC policy rather than anything inherent in the design. The USAAC wanted to use turbo superchargers or turbo chargers on high altitude engines rather than mechanical superchargers. So, Allison put little effort into developing two stage ones like other nation's engine manufacturers did. Even suppliers to the USN developed two stage superchargers for their engines. But stupidity and short-sightedness of that sort on the part of military officers and bureaucrats was common to every nation's military then and now. So, you could have crammed a DB 601 in a Spitfire and ended up with the same aircraft, even improved the early models using it. An Allison would have worked too although altitude would have been limited. And there were plenty of aircraft that could out dive a Spitfire. It is also highly doubtful that Mitchell deliberately designed in a critical Mach number but rather got lucky as transonic flight was pretty much an unknown subject in the late 1930's. If you look at the problems Lockheed and Hawker had with thick wings (P-38 and Typhoon) and high speed flight you can easily see that aircraft designers of that period had a poor understanding of it and of transonic flight regimes. As for the rest, it's true. Spitfires didn't show up in the CBI until the end of 1943 and then their use was limited. The Russians got a couple hundred but really didn't like the plane. It had serious issues using Russian airfields and was considered a dangerous plane to taxi with. It lacked range too which doesn't help in a theater as large as Russia. They also didn't like the wing mounted armament preferring nose mounted guns. In the SWPA the Australians used a relative handful for defense of Darwin and the NW provinces, and a handful more at Port Moresby in New Guinea for airfield defense. These and later deliveries started in 1944 to be used in limited offensive operations mostly because of the short range. They weren't used at all in the Pacific Theater. In the Med, they were usually used for air defense with the P-40 and Hurricane being the offensive aircraft, particularly if ground support was involved. The USAAF for example for the invasion of Sicily had to build an airfield on Gozo (next to Malta) to allow the 31st and 52nd FG's to operate their Spitfires over Sicily. Other USAAF fighters operated out of N. African bases because of their greater range. The 31st was also moved ashore after the Salerno landings and then to Anzio for air defense because of the Spitfire's short range. Things like the "Palm Sunday Massacre" of German transport aircraft flying from Italy to Tunisia was accomplished by longer ranged P-38 and P-40 aircraft not Spitfires. The Spitfire was an excellent defensive fighter, as was the Me 109. But, it lacked the range to do offensive work and once the BoB was won what the Allies needed in every theater was offensive aircraft with good range. The Spitfire wasn't going to handle that mission and got superseded in it by other planes. In the fighter bomber mission the same thing is true. The Spitfire simply couldn't haul a good bomb load the way a P-47 or Typhoon could. Even the Hurricane out did it in that role. If you want a truly "universal" fighter in terms of deployment and use in WW 2, it is hands down the P-40. That plane flew in every theater of the war to one degree or another and in most theaters was a, if not the most, significant fighter plane in use. That goes for the MTO, CBI, SWPA, Pacific, China, and many tertiary theaters as well. Even in the ETO US and Canadian use was significant. Had to go Spitfire this time. While many might feel, as I did, that the Eindekker was the FT-17 of the skies in influence, on further reflection, I don't think this is the case. It had a successful device that allowed an mg to fire through the propeller which was copied. Nothing else was afaik, biplanes were still preferred over monoplanes for the foreseeable future. The Spitfire was one the most significant fighters of WW2 (2nd after the Me109 imho) and actually best for a greater period of time in the same role as the Fokker. The Fokkers main claim to fame is that it allowed an almost successful attack at Verdun, the German build up being hidden from aerial view. The Spitfire helped save an entire nation, and is probably the most famous piece of kit of WW2. i vote for the Eindecker, because EVERY fighter plane can trace it's roots from Fokker E-I/ III. the first true fighter plane. anything before it were sad attempts.